This is a high priority claim! Without these textures, exterior work on the northern Gold Coast cannot continue. This should be a simple job for a good texture artist. 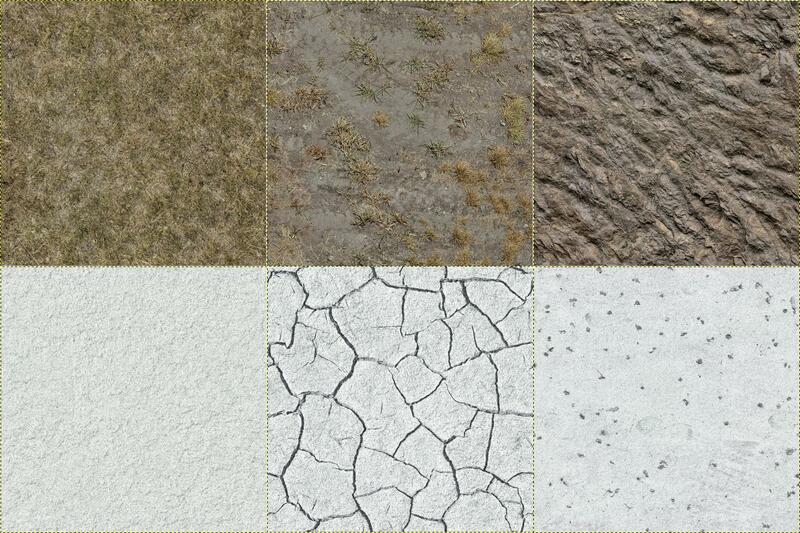 Ground textures and terrain assets for the Gilded Hills region. This region is a transit zone between the Gold Coast and the Colovian Highlands, and is described as a dusty savannah-like plateau, semi-mountainous and fairly arid, influenced by the northern deserts. Textures can be based on edited Gold Coast textures, as most of the flora will remain the same/similar. The defining aspect of the region is the large salt lake in its center. 2-3 salt plain ground textures for use in and around the salt lake. Same textures should also be usable on salt rocks and mounds. Check Lythondea for possible inspiration. Grass, rock, sand and dirt textures for the Gilded Hills. Darker and less vegetation than the Gold Coast ones, but otherwise in a similar style. Rock textures should be applicable to the region's rock meshes. Had another free evening. Claimed, or at least partially. If you need more, somebody else may need to take the claim over, and there's not a plugin, but hopefully that can get you started. Hope it looks okay! Looks like this is exactly what we need, thanks!